Home » Fourth or Forth: What’s the Difference? English spelling can be a difficult concept to grasp. There are some words which are spelled differently depending on where they’re used, and some that are spelled in ways that don’t correlate at all with how they’re pronounced when spoken aloud. Fortunately, some spelling differences are easy to remember. The words forth and fourth only have one letter’s difference between them, but they are actually completely different parts of speech. Additionally, there is a very simple way to remember which word belongs in which context. In today’s world of word processors and online documents, most spell-checkers will correct you if you manage to use these words incorrectly. These programs are not perfect, however, so it still pays to know what these words mean. What is the Difference Fourth and Forth? In this article, I will compare fourth vs forth. I will use both of these words in at least one example sentence to illustrate their proper context. Plus, I will discuss a helpful mnemonic that you can use to decide whether you want to write fourth or forth. What does fourth mean? Fourth is an adjective. It describes an item in a sequence that is preceded by three other items, such that it forms the corollary to the number four. The pitcher struck out the fourth batter he faced to end the inning. The fourth day in July is preceded by three earlier days in July. I bet $900 a horse named Chips Ahoy, but he finished fourth. What does forth mean? Forth is a directional adverb. It means forward or ahead. You can see examples of its usage in the sentences below. If we want to reach the castle, we must venture forth. “Go forth and do likewise,” said the preacher. “Sally forth and retrieve the hostages,” commanded the general. The popular phrase “back and forth” makes use of the word forth. It might be tempting to assume that forth and fourth are two different spellings of the same word, and that one is the American and one is the British spelling. This convention holds true for many similar words in which a U follows an O, and is in turn followed by a consonant. In this case, however, these two words are completely different. If the word you are using is an adjective, choose fourth. If you are using the word as an adverb, it should be spelled forth. 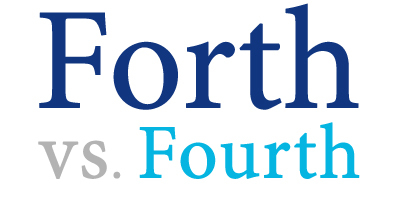 A trick to remember forth vs. fourth: You can remember that fourth is an adjective describing a number in a sequence since it corresponds with the number four, and you write four on your way to spelling fourth. Is it forth or fourth? These two words, while spelled similarly, have completely different meanings and functions in the sentence. Forth is an adverb that means forward or ahead. Fourth is an adjective that means an item in a sequence preceded by three earlier items. The two words are never interchangeable; they are different parts of speech. You can remember that fourth represents a number in a sequence since its spelling includes the word four. To summarize, forth is an adverb, while fourth is an adjective. Please feel free to reread this post any time you aren’t sure whether you mean fourth or forth. 1 What is the Difference Fourth and Forth?